Uniesse Marine production is marked by a line of pleasure and fishing boats that are refined and elegant at the dock and real racehorses under way and that are capable of offering reliable, safe and comfortable rides. The 42 Open, the most recent Uniesse Marine product, is a very interesting boat not only because she complies with the above-mentioned characteristics, but also because she is an extremely reliable boat capable of offering extreme pleasure. She has a beautiful low outside line and is swift under way; with appealing fore-and-aft passages and top-quality finishing. Under way, her stability, safety and comfortable ride are a real surprise. Good use is made of outside space, with rationally positioned and easy-to-use fittings. 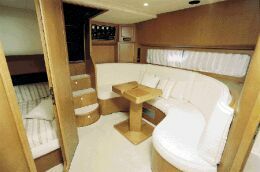 Belowdecks, the boat is decorated with marine and essential wooden paneling. Special attention was given to inner spaces and to the ample bathroom. 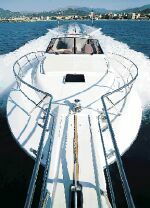 The 42 Open may be considered an elite pleasure motor yacht and is solidly built and reliable, in compliance with the current enforced construction rules. Draft from lower tip of propellers: 4'1"
Full boat displacement: 33,113 lbs. Total engines and reduction gears weight: 3,532 lbs. Price with standard equipment and test boat power: Lit. 580,000,000 ex VAT. Galley: granite worktop, two electric hob range, refrigerator, microwave oven, extractor, cabinets and cupboard. Standard fittings: generator, water heater. Docking maneuverability: easy and safe. Electrical switchboard and plants: suitably made and adequately positioned.